Fashion design schools commonly participate in competitions and fashion shows to gain real-world experience in the design industry, but another project has caught the attention of many students. “Little Dresses for Africa” is a program that sends clothing, dresses, to Africa for girls that have no clothing. Fashion design schools across the county are holding workshops and work-events for students who want to help out with the cause. Fashion design students at high schools are becoming involved, too. Lake Highlands High School fashion design program teaches students the fundamentals of design and are working with a college sorority on the Little Dresses for Africa project. Nicole Alozie, a junior in the fashion design program at Lake Highlands was born in Nigeria and moved here in 1997. In an interview with NeighborsGo, Alozie said “It makes me feel accomplished.” The dresses are for girls ages 2 to 12 and fashion designer students are making an extra effort to embellish them in ways that make the children feel special. This project isn’t reserved for fashion design schools and students, however. Anyone who makes clothing can donate dresses to the cause. Lillian Weber is a 92 year old in Iowa who also makes Little Dresses for Africa better able to fulfill its goal. Weber told The Republic that she likes helping the girls in Africa and recently inspired a group of children to find ways to donate fabric for her work. Weber’s daughter is an elementary school teacher whose class sold concessions at sports games at their school to raise money for the fabric that Weber needed to complete her miniature fashion designs. The “Little Dresses for Africa” project is led by the Alpha Kappa Alpha college sorority’s Dallas Chapter. 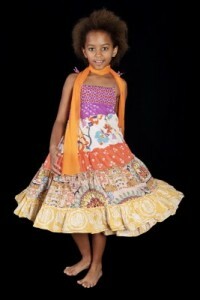 The little dresses are shipped to African girls who are orphaned by HIV and AIDs or other illnesses. Fashion design school students and community members help create Little Dresses for Africa thanks to college sorority….